In the middle of Paul’s instructions to the brothers and sisters in Ephesus regarding the “new self, created to be like God in true righteousness and holiness” and practical ways that new self is demonstrated in everyday life, he exhorts us not to grieve the Holy Spirit. The verb “grieve” and the pronoun “whom” are very clear in communicating to us that the Holy Spirit is a person, not just an influence, not just our conscience, and not just a power. The Spirit is a “he,” a “him.” And it’s through him that our Christian ministry receives its authority and its might. The Holy Spirit of God who brought Jesus out of the tomb lives in us to empower us to do the things he calls us to do. That power is the grace by which we are called and the authority by which we speak. I appreciate the way Eugene Peterson speaks of the Spirit in Christ Plays in Ten Thousand Places: he says the Spirit “is not marginal to the main action, it is the main action.” All of creation, all of salvation, and all of community takes place because of the Spirit of God. God’s Holy Spirit produces in us the character traits and the confidence necessary for Christian ministry. The Spirit intercedes for us to our Father in words we can’t begin to express. God’s will is revealed to us by the Spirit. The Spirit gives life and guidance, purpose and protection. The Spirit of God lives in us to accomplish what is impossible without him. It’s beyond our capabilities as humans to keep God’s commands, to follow Christ perfectly, to spread the Gospel message to all the world, to redeem the lost back to God. We’re only human. Not so with the Spirit. We’re super-human. God-filled. Able to do all things. Undefeated. Inspired. Invincible. For a thought-provoking column on what worship is NOT, check out this recent entry on the blog of my great friend Jim Gardner. Just two more days until football season officially begins! And I’m happy to report, no more kickers or punters remain in the countdown. Today’s #2 is one of the all-time greats in college football and the only player in NFL history to return eleven kicks for touchdowns: Eric Metcalf. 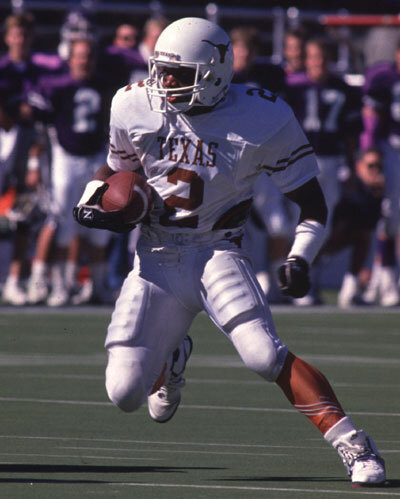 As a halfback/receiver/returner Metcalf set the all-time Southwest Conference record for most all-purpose yards (5,705) and was the SWC MVP as a Texas Longhorn in 1987. He set the school’s single season all-purpose yards mark that year (1,925) and is the only player in Longhorns history to lead the team in all-purpose yards four years in a row (1985-88). During his time in Austin, Metcalf also won the national championship in the long-jump. Twice. Metcalf’s eleven year NFL career was spent in Cleveland, Atlanta, San Diego, Arizona, and Baltimore. He’s the all-time NFL leader in return yards (6,982) and #13 all-time in combined yards (14,434). He was quick and elusive and deceptive as a runner. But he just wasn’t big enough (5-10, 188) to do much of anything else but return kicks in the pros. Eric Metcalf is the all-time best to ever wear the #2. Sorry I was so late in getting the Cowboys predictions posted yesterday. If you haven’t seen it yet, go back to yesterday’s entry. I’d love to get your feedback. Thanks for the link to Jim’s blog – good points for a live discussion. Metcalf gets a grudging nod at #2 but only because he had the number in college and pro. College only would have to go to Mr. D. Sanders. I’m guessing #1 will be another player with Houston ties – Mr. Moon. I meant to include Crime-Time in as an honorable mention along w/his mugshot from his fishing arrest in Florida. If I have time, I’ll add that later today. Don’t get ahead of yourself on #1. Did I give it away by saying it wasn’t a kicker? Or did you already figure it wasn’t Rafael Septien or Efren Hererra? Your un-natural obsession with Columbia Blue is your undoing. I don’t recall anything about it not being a kicker but how could it not be Moon? I’ve always been a Cowboy fan yet these guys don’t make it to the same level as Mr. Moon.